1955 was the golden year of the Mercedes-Benz 300 SLR. It enjoyed an unprecedentedly successful run, comprising one-two or even one-two-three wins. These outstanding triumphs assured Mercedes-Benz of the 1955 Worls Sports Car Championship title. Mercedes-Benz Classic is now presenting a new book on the legendary racing sports car, its races and the people behind it. The text has been penned by well-known motor car author Günter Engelen on the basis of meticulous research in the archives. This unique, exclusive monograph is available in a limited and numbered edition and represents the first volume of the new series “Milestones of Motorsport”. Born in 1938, in his capacity as an motor car journalist, Günter Engelen has been concerned with the history of the motor car, and Mercedes-Benz in particular, since 1985. Whatever topic he tackles, he always researches the subject matter in hand with an unerring attention to detail that lends the stories he relates a vivid authenticity and brings history to life. For the new standard work “Mercedes-Benz 300 SLR” Engelen dug deep into the Mercedes-Benz Classic Archive, compiling documents and information to create a book that has the makings of an icon in its own right. The Ostfildern-based Hatje Cantz Verlag publishing company is presenting the book in fittingly exclusive style, including a slipcase. It is being published in a German and an English edition, each limited to 999 numbered copies at a price of 199 euros. The Mercedes-Benz 300 SLR was one of the stars of 1955. In addition to the Formula 1 World Championship and the European Touring Cars Masters, this year also saw the vehicle win the World Sports Car Championship, demonstrating Mercedes-Benz’s unprecedented and unchallenged dominance of international motor racing. 60 years ago, Stirling Moss and Juan Manuel Fangio, the most successful drivers of their era, achieved impressive wins at the wheel of the 300 SLR in the world’s most demanding road races, bestowing on this superlative racing sports car a special renown which it has maintained to this day. As Volume 1 of the new book series “Milestones of Motorsport”, the book documents the technical development of the 300 SLR, which was allocated the internal designation W 196 S, as well as all the vehicle’s racing assignments and – for the first time ever – the biography of each individual vehicle. 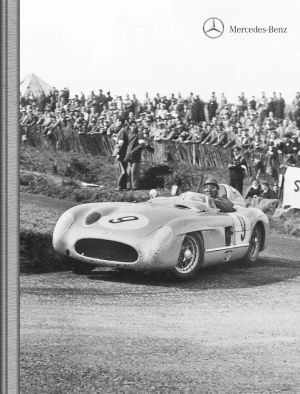 It also describes the technical developments for the following 1956 season, in which Mercedes-Benz did not compete, having withdrawn from motor sport. Photographs and illustrations, some of which have never been published before, high-quality graphic design, and a lavish presentation make the book a collector’s item. Mercedes-Benz 300 SLR. Milestones of Motorsport, Volume 1. Edited by Daimler AG, Mercedes-Benz Classic, text by Günter Engelen. Published by Hatje Cantz Verlag, Ostfildern, May 2015; hardcover, 256 pages, 288 photographs and illustrations, in slipcase, numbered and limited to 999 copies in German and English respectively. 199 euros. ISBN: 978-3-7757-4000-5 (German), 978-3-7757-4001-2 (English). Available at the Mercedes-Benz Museum shop and from bookshops.